The Star Trek universe has certainly had its fair share of oddball characters. These characters usually took the form of alien observers of human culture—be it Spock on TOS, Data and Worf on TNG, Odo and Quark on DS9, and Tuvok, Seven of Nine, and The Doctor on Voyager. They were sources of comic relief who were often baffled by human social interaction. At a certain point, that becomes a cliché to have the social outsiders be alien. Even in Gene Rodenberry’s utopian humanity, there can still imperfect humans, be it the curmudgeonly Leonard McCoy or the agoraphobic Reginald Barclay. 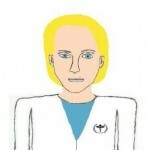 With that in mind, I have gone as far as to create a character who has Asperger’s syndrome, moving away from the notion that present-day diseases and disorders have been cured by the 24th century (keeping in mind, however, that not everyone in the present day medical community believes that Asperger’s is a disease or disability to be cured). In the utopian humanity of the 24th century, one need not ascribe certain conditions such as Asperger’s, Obsessive Compulsive Disorder, Bipolar Disorder, Narcissistic Personality Disorder, or Social Anxiety Disorder to these socially awkward characters whether human or alien. In the case of Doctor Aurellan Markalis, she had displayed personality traits consistent with Asperger’s syndrome since the start of Lambda Paz, but those traits were not openly associated with Asperger’s until Season 2, Episode 5: “A Cause of Greater Worth”. It was the last in a three-story arc that also indicated that 24th century humanity did not freely use terms such as gay, straight, lesbian, or bisexual in revealing that another character is bisexual. Taking all that into consideration, some of us can’t help but put those kinds of labels on our favorite fictional characters even if without so-called “in-universe” references to them. In fact, the thAutcast.com blog, created by “self-diagnosed aspie” Landon Bryce, includes postings devoted to “The Big Bang Theory” and its characters who have Asperger’s traits—Sheldon Cooper and Amy Farrah Fowler. While that was never creator Chuck Lorre’s intent, viewers cannot help but notice their unique personality traits. So how would you “diagnose” the “oddball” characters in fan fiction stories even if they received no formal in-universe medical diagnosis? Blog Like A Boss Prompt #4: What character do you love to write most? What about them makes them so compelling?